I think about: Buying things, buying food, buying bodies, buying inclusivity and exclusivity and subjectivity. 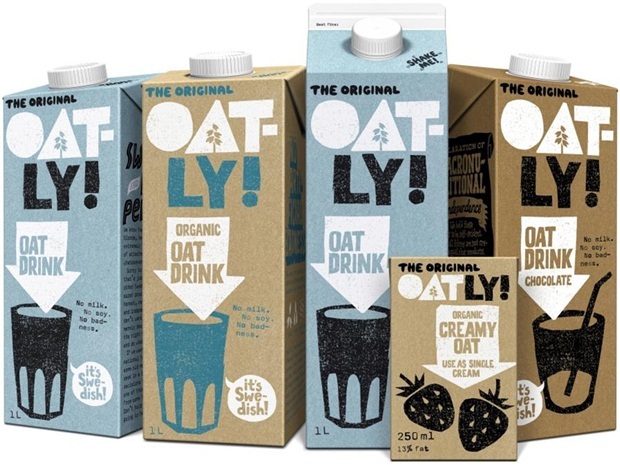 In Sweden, in the fall of 2014: The company Oatly sells its oat based products with slogans such as “It’s like milk only made for humans” and “Wow, no cow!” which made LRF Mjölk (the national organization for diary producers) angry and they sued Oatly. In the end, I think Oatly won (I’m not very good at understanding trials and commercial law, but I read that the process raised the sales figures). OK, milk producers being upset about what should count as Real Milk is not really a new thing, but still, I think this thing with Oatly and LRF make visible something about the relation between drinking milk and being human…and being Swedish. 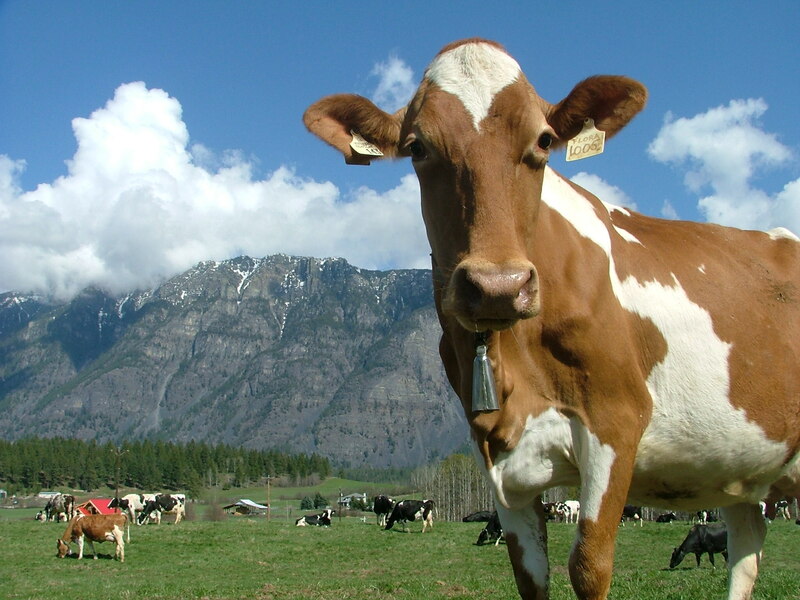 The dairy industry quite often sells their products using arguments like, “From Swedish farms.” They also work hard to produce a history of milk-drinking Swedish people, and a Swedish self-image that includes drinking milk from cows. 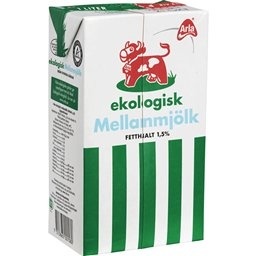 It has worked so well so that “Landet Mellanmjölk” has become almost a synonym to Sweden, referring to a Swedish people as being moderate (“mellanmjölk” means pasteurized cow milk with 1.5 % fat). Making milk-drinking a criteria for Swedishness not only make violence part of the Swedish history, but also creates a limit for who can be a “real” Swede. It is a definition that excludes everyone who doesn’t want to be part of the milk industry, and it also, very physically, excludes those bodies (for example many Asian-Swedish bodies) that are hurt by lactose and so on. So, LRF’s reaction to Oatly’s campaign also reflects the threat felt by an Astrid-Lindgren-blonde-healthy-good-racist Swedishness to the national self definition. I hope my references concerning Swedishness are not too internal. I recognize the history of racism and racial biology in Sweden. I think about the “folkhem” (welfare state, literally translated as “the people’s home”), “folkhälsa”/public health, and the violence and exclusions in these concepts. I recognize how Lindgren’s books have been used to define real Swedishness and a romantic nationalism, something light and bright and fresh and white. 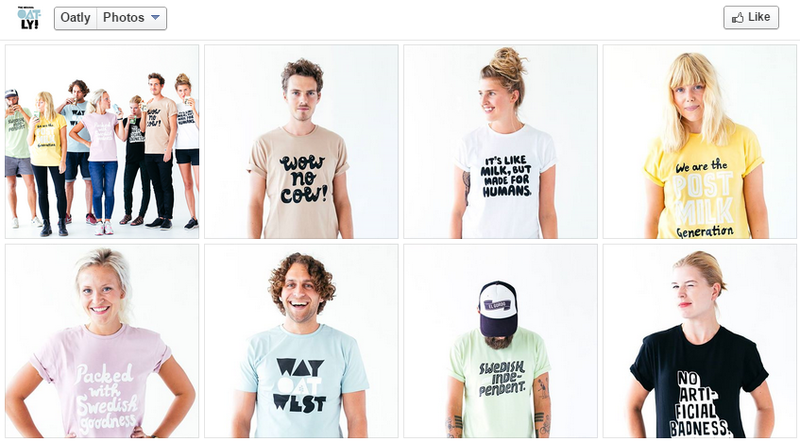 Firstly, in the end of 2014, Oatly launched Oatly Apparel featuring t-shirts with their slogans written on them. The photos of the t-shirts on their Facebook page show only white models. People have reacted to this, and Oatly writes that the models are their friends who did the shooting for free, and that they gladly show cool people of other ethnicity, gender and sexuality in other spaces such as Instagram. Looking at their Instagram, I can see that they might be sort of right, but mostly I see only the packages of the products. I think the whiteness of the models are also problematic and connected to “Swedishness.” Seeing a blonde girl dressed in blue jeans, jogging shoes, and a pink t-shirt saying “Packed with Swedish goodness” doesn’t really broaden the definition of Swedishness. Using Sweden in their rhetoric might be a sort of counter-strategy. For example, it is working against the milk industry, connecting the Swedishness, not with Mellanmjölk, but with oat. And for a buyer in Sweden, the ecological aspect of using Swedish (i.e. local) oat might be of importance. However, consider also the name. I can only think of American Apparel (and I most often don’t want to think of American Apparel), and well, Apparel might have other connections than American Apparel, but it’s not very often used in Sweden, and I think the choice to use the word might come from a similar strategy as the Swedish-thing. It is a way of using words in a different way: I can think of sexist American Apparel pictures and all the debate about them, I can see non-pornographic pictures with the same word connected to them, and I can think, wow, words can have different meanings, or something like that. But, I still think the Swedishness aspect is problematic because of the whiteness and because of the “goodness.” Lately, the “goodness” (the superiority, the equality and being-best) of the Sweden (or the [self] picture of Sweden, or of Swedish history) has been questioned in different ways. Recall that Sweden was the first country to have a national racial biological institute. Observe that “neutral” can never be neutral because neutrality can never exist. Remember that Sweden has also enacted war and colonization. Researchers like Tobias Hübinette discuss Swedish whiteness as a discourse of Sweden as the whitest country, with the Swedish whiteness as the purest. This discourse creates violence on a lot of bodies. This Swedish whiteness is what I think about when I see Oatly’s t-shirts. It is a violent whiteness and it hurts. It reproduces a picture of a white Swedishness and Swedish whiteness. We know how it sounds. Tall, blond, beautiful, hard to get, extremely liberal with no sense of attachment or responsibility whatsoever. Sorry to disappoint you, that’s just not us. We are the other Swede – somewhat boring, super practical, painfully honest, notoriously hardworking and independent not because we don’t want to be social but merely because we want to have the right to say what we think and do what we think is right. It’s like, they make fun of the Swedishness, but they hardly challenge the whiteness. They also keep the discussion somewhat middle class-bound (that can be discussed), within a hipster-ish circle, and in line with a discourse of superiority. And then consider the use of the language, the consciousness, the negations. I mean, I think you might only want to abnegate your Swedishness if you’re not really risking losing it, and it might be impossible to distance yourself from it if you’ve never really been included. So, I think that using Swedishness in any way is problematic. Maybe especially at the moment, when the elections in 2014 gave at hand that the third largest party in Sweden is a racist, nationalistic and fascistic one. I mean, I don’t think that nationalism in any case can save the world, or do much good, because nationalism per se is based on excluding (but still, some sort of “nationalism” might be temporally needed to fight colonialism and so on, though, Sweden doesn’t really need that kind of temporally nationalism). Secondly, the use of goodness is, I think, another problem. For me, goodness is closely connected to Christian ecclestical discourse, and in the name of that goodness a lot of violent actions have taken place, like missionary colonialism and burning women for being witches. I think: The most violent and cruel actions are often made for goodness sake. And I think: in order for the good to exist, there must be a bad, and for some people to be good, some must be called bad, this creates a dichotomy that will always hurt the Other. Goodness is also related to the individualistic view of the world. The goodness is tied to the individual person, who, by eating and drinking and buying Oatly’s products will do a good action and become a good person. And the problem is: Not hurting other is something that can never be done for your own ego, because then it is easily the case that what will gain this ego is instead something that will hurt other. On the webpage for a post-humanist seminar in Lund, Sweden (that I wasn’t able to attend and for which I am crying my eyes out! ), I read about the research of Claire Molloy (of the UK). I want to cite it because I can’t write it better! She also problematized the (at least in the anglo-world) ongoing mainstreaming of (celebrity) veganism, arguing that when veganism becomes another private consumer choice, a hobby to find easy pleasure and fulfillment in, it easily gets detatched from its ethical dimension and radical driving force. The risk is that the long term goal of abolishing the use of animals in food industry disolves and disappears under the horizon. I think this can be connected to the goodness concept. There are a lot of “good” celebrities, and it seems to me that it is quite easy for them to be “good” because they have the money, the power, and the opportunity. Not everyone has this privilege. This is another reason why goodness is a problem. So, I think about Oatly, about being good, about buying things and selling things and living in a nation and who could be a part of this nation. I think that the problem is probably the market and the commerce and the capitalism, and the language and discourse existing within these, and building these. I think about violence and veganism and goodness. And the problems of how things get connected. And then, I think, I still like Oatly’s product (maybe except for the t-shirts). This entry was posted in Nonhuman Animal Rights & Speciesism, Whiteness & Critical Race and tagged Alternatives, Capitalism, Cows, Dairy, Nationalism, Nationality, Oatly, Race, Sweden, Whiteness by Vegan Feminist Network. Bookmark the permalink.